THE GREATEST GIFT and I are hitting the road this November!! 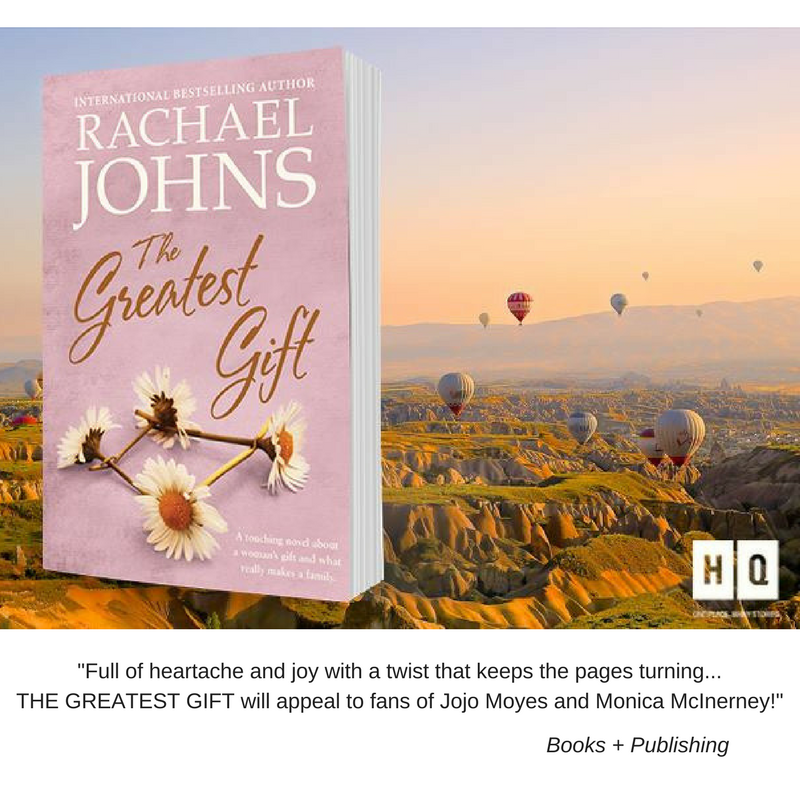 With only two weeks to go until THE GREATEST GIFT hits shelves – physical and digital – across Australia and New Zealand, I’m excited to let you all know that I’m embarking on a tour across five states to meet readers, sign books and talk inspiration behind the book, writing process and much, much more. Details of the events so far are below and I will update details as they come on my Events Page. Books will be available to be bought from Garden City Dymocks and signed on the night. The evening will start with a glass of champagne and some finger food as Rachael mingles with the guests. Then author Natasha Lester will join Rachael in conversation about writing, love in all its forms and the journey to THE GREATEST GIFT. Books will be available to be bought from Dymocks Busselton and signed on the night. Books will be available to be bought from Dymocks Morley and signed on the night. Books will be available to be bought from Dymocks Joondalup and signed on the night. Books will be available to be bought from Dymocks Carindale and signed on the day. Books will be available to be bought from Dymocks Chermside and signed on the night. Books will be available to be bought and signed on the night. Books will be available to be bought and signed at the event. N.B. This is not an author talk, just a book signing. The High Ground, Geelong Library and Heritage Centre; 51 Little Malop Street, Geelong. Mount Barker Library; Dumas St, Mount Barker. Enquiries: Dillons Norwood Bookshop 8331 0946 or Payneham Library 08 8336 0333. Books will be available to be bought from Dillons Norwood Bookshop and signed on the afternoon. Tickets: FREE but RSVP essential! Previous Post General Fiction Book of the YearNext Post LOST WITHOUT YOU finally in stores down under! Just wondering if you are coming to Tasmania? And what is the next book you are going to write? I’ve read all your books and it’s hard to find an author who I can’t put the book down. Hi Tenille – thanks so much for your message. So glad you’re enjoying my books! I’d love to come to Tasmania and am currently trying to organise a trip with my author friend Fiona Palmer. We can’t seem to make contact with the right people though and are struggling to find libraries to hold events – do you have a local library contact who may be interested in hosting us!? x Rach! Hi Thanks for “The Greatest Gift”I enjoyed reading it so very much. Was wondering if the poem Polly read at Claire’s funeral..”It feels like winter is here to stay” was by Penelope Bruce as I can’t find her work anywhere. Loved this poem & would like to read more. Thanks again. Hi Rachel, I’ve only recently gained access to (and thoroughly enjoyed reading) a couple of your books (‘Man Drought’ and ‘Jilted’ – Unputdownable! I’m especially thrilled I can now go ahead and read the copy of ‘The road to Hope’ you signed at The Knowledge Centre in Gosnells, Western Australia in Nov 2017. Fantastic knowing these places exist – sent time in one or two (or know people who lived there. You’re making this ours, the issues are real and the dialogue believable and I love that! :-) Keep it up – I plan to ‘work’ my way through the list of books (book mad since I can remember). Thanks Rachael. Hi Theresa – thank you for your lovely message. So glad you’re enjoying the books. I’ll definitely do my best to keep it up. x Rach! Hi Jane – lovely to hear from you. Penny is actually a close friend of mine – she doesn’t have anything else published but she does have a FB page where she posts some of her work – https://www.facebook.com/sometimesiwritepoetry/ 🙂 Rach! I am reading Greatest Gift, crying through it too. It’s beautiful, I truly hope that Jasper finds happiness again! Greatest Gift is wonderful, reading it at the moment. Using plenty of tissues as I go along. Hope Jasper finds happiness again.